Largehearted Boy: Book Notes - Marcela Sulak and Jacqueline Kolosov "Family Resemblance: An Anthology and Exploration of 8 Hybrid Literary Genres"
Book Notes - Marcela Sulak and Jacqueline Kolosov "Family Resemblance: An Anthology and Exploration of 8 Hybrid Literary Genres"
The Family Resemblance anthology's diverse and talented collection of authors (including Maggie Nelson, Nick Flynn, Etgar Keret, Rachel Zucker, Kathleen Ossip, and Terrance Hayes) explains and offers examples of hybrid literary genres. Family Resemblance is arranged in eight chapters, hence our structure below. 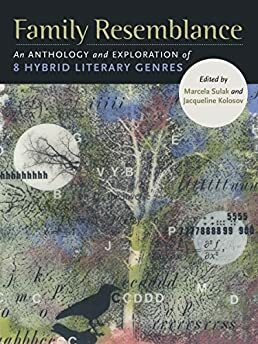 Each chapter brings together excerpts and in some cases self-contained pieces by 5-6 writers from the U.S.as well as Israel's Etgar Keret and Japan's Takashi Hiraide. Each excerpt is prefaced by a piece by the writer that discusses his or her rationale for working in that particular hybrid form. The surrealism of this song—the slightly menacing, slightly clownish, drunken accordion makes the floor buckle and lurch. Tom Wait's gravely voice feels as if it's pressed up against my ear, but a little too loud, and inappropriately close. This is how the performative genre often feels—exciting, dangerous, because it's doing what it's not supposed to do. Performative pieces say the things that mustn't be said—the things that one means when one says something else. They are what one is when one appears (to others) as something else. I saw Tom Wait's –Black Rider performed on stage when I was living in Tubingen in 1997, seven years after its world premiere, also in Germany. It was co-written with William S. Burroughs, which might tell you all you need to know. Based on the folk tale Der Freischütz (which was made into an opera by Carl Maria von Weber) the song is about a man who makes a pact with the devil, gets magic bullets and accidentally kills his love in the guise of a white dove. The pact the hunter makes with the devil ensures that appearances will ALWAYS deceive. Because in focusing on PERFORMANCE of identity, performative works oddly posit identity as a stable (mostly) phenomenon. The stable part of identity is the part that no one else ever recognizes—it's the part that the other constantly gets wrong. And sometimes that mistake can be fatal. I have long thought of the Beatles' "A Day in the Life" as the quintessential song for essayists. The song highlights life just being life, but that it's also unexpected if you're observant. The song says life is slow, but fast, too. Melodic one moment and then cacophonous the next. "I read the news today, oh boy," Lennon sings, the most quotidian thing in the world. The news is sad, but he laughs. The rest of the song's narrative doesn't depart much from that everyday life: A man reads the news. A man goes to the movies. A man goes to work. "Woke up, got out of bed…" McCartney sings in the middle-eight. It's a pedestrian sort of narrative, but a great starting spot for the essayist who, like the essayists in this chapter, use the small moments of life to muse over life's weightier matters. I love, too, the change in mood throughout the song. At first slow, calm, peaceful with the piano, guitar and shaky percussion. Then building momentum into that messy symphonic crescendo into the simple alarms clock, a fast-paced even-rythmed rush to the bus, the floating background chorus of the dream which fades to the galloping beat of the last verse, which builds again to chaos, resolved by a simple chord. The essays in this section similarly work with moods, building and breaking them up in ways that surprise and delight. This opening song from Mermaid Avenue is 3 minutes and 53 seconds long, long enough to smoke a cigarette (if you smoke). One of flash's other names is the smoke-long story for precisely this reason, and "Walt Whitman's Niece" tells a story, sort of. But first: a bit of context. Woody Guthrie wrote this piece in 1946. After his death, his daughter approached Bragg about writing some new music to accompany the lost songs that became Mermaid Avenue (the name of the street in Coney Island, on which Guthrie lived with his wife and kids after World War II). There's plenty of emotion here and a wealth of experience, but how much of it can be enacted in flash which cannot be crowded though the back story—all that lies behind what appears—is often "felt" by the reader. The Cuban Silvio Rodriguez's song "Ojalá," is a series of pictures made of words that describe the impossible/the not/yet/the desired, all concepts contained in the word "Ojala," which is like saying "may it be that." Its simple acoustic guitar strumming that sounds like a firm, gentle, welcomed rain made it a popular song in every South American city where there are universities, and guitar-wielding students sitting in circles dreaming of the future. Certainly in pre-Chavez Venezuela among the biology students, which was my first experience of the song. I later encountered it among Mexican Ph.D. students in Texas. What's so beautiful about this song is that we never see the addressee—we only see the way the world arranges itself around the unseen body, and it is the unseen body that makes the world visible. At its best, this is what the "Pictures made of words" genre does—the invisible body of the artist, of the observer, places us in the physical world in a sensual way. The song begins, "May the leaves not touch your back when they fall, so that you can't turn them to crystal, may the rain cease being a miracle that falls over your body." I love how the unseen body draws attention to, orders, and transforms the visible, physical world. And, though the unnamed addressee is invisible, he exists. In fact, were he to appear incarnate, it would kill him. The chorus is: "I hope a constant gaze finishes you off, the precise word, the perfect smile."